Tsipouro/Tsikoudia ist ein echtes griechisches Produkt, das eng mit dem griechischen Lebensstil, der Gastfreundschaft und Unterhaltung der Griechen verbunden ist. Er wird aus destilliertem Traubentrester gewonnen. Der Herstellungsprozess beginnt mit der Auswahl der Traubensorten und dann finden die sorgfältige Gärung des Tresters, nämlich der Pressrückstände verschiedener Rebsorten (ein Verfahren, das unentbehrlich für die Herstellung von Wein ist) und die langsame Destillation des vergorenen Tresters Schritt für Schritt statt. Hochwertige Trauben stellen einen integralen Bestandteil der Herstellung von Tsipouro erster Qualität dar. Folglich spielen Faktoren, wie z.B. die Traubensorte, die Zusammensetzung des Weinbergbodens, seine Höhe und Orientierung, das jeweilige Jahr, die Anbaupraktiken, die Zeit der Weinlese, usw., eine wichtige Rolle beim Endprodukt. The distillation of the grape marc for the production of Tsipouro is a complex process that calls for specific knowledge and expertise, experience and modern technological equipment for the purpose of yielding the optimum result. The distillation fractions are separated into the head, heart and tail. The head features a high alcoholic strength and contains compounds with a sharp taste and aggressive aroma, whereas the tail comprises higher alcohols with a heavy aroma and taste. The heads and tails are removed and return to the still along with the next batch. The heart, on the other hand, the distillation fraction of the highest quality, is diluted, left to mature and filtered and in turn moves on to the bottling line. Certain distillates may be selected and left to age in oak casks for a number of years to impart characteristics of spices, dried fruits, vanilla, chocolate, smoky aromas, hints of leather, barrel wood, etc, depending on the type of Tsipouro and ageing conditions. Tsipouro that has not aged in oak casks primarily displays fruity and flowery characteristics rather than spicy ones. In certain regions of Greece, aromatic seeds or plants (such as anise, fennel, saffron, walnut tree leaves, etc) are also added to the still apart from grape marc, in quantities and at proportions that form well-kept secrets of each and every producer. Thessaly, Macedonia and Thrace traditionally produce not only Tsipouro without anise, but also Tsipouro characterized by the addition of anise seeds and fennel during the distillation phase, which turns cloudy white when mixed with water. The first production of Tsipouro was the work of monks back in the 14th century. This idea of using the residues of the wine-making process in order to produce a distilled spirit was gradually passed to viticulturists. That was how the viticulture product named Tsipouro/Tsikoudia was born. The production of Tsipouro constituted an exclusive privilege of viticulturists up until 1988, who produced it for their own consumption and marketed limited amounts in bulk within their own or neighboring prefectures. In 1988, the legal framework was created stipulating the conditions regarding the production and bottling of Tsipouro by organized units that would comply with all the required specifications laid down in the respective national and EU provisions. 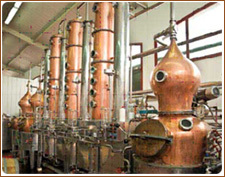 The quality of Tsipouro has now been improved and its image upgraded thanks to the production and bottling of Tsipouro by organized units equipped with high-technology infrastructure, applying contemporary know-how and making use of modern ways to approach the market, thus laying the foundations for the purpose of promoting and establishing the product throughout the globe. In fact, the latest revision of the EU legislation on spirit drinks has led to the recognition of Tsipouro/Tsikoudia as protected designations of spirit drinks exclusively produced in Greece and the establishment of the respective geographical indications for the regions set forth below: Tsipouro of Thessaly, Tsipouro of Macedonia, Tsipouro of Tyrnavos and Tsikoudia of Crete. The traditional values of Greek nature, the precious gifts of the Greek countryside, the genuineness and hospitality of all Greeks have always been reflected in this spirit drink stemming from grapes, Tsipouro. It has always been synonymous with Greek hospitality. It is the drink bound to relax us, the drink that urges us to join in and communicate with our friends, gather around a table and savor a wide assortment of traditional spicy mezedes, namely side dishes, constantly alternating flavors and aromas of the Greek mountains and deep-blue sea. Tsipouro indeed makes an excellent accompaniment to pungent-tasting meat and seafood cooked in a number of ways, matured cheese and processed meat products, not to mention pure earthy dishes such as pickles, grilled wild mushrooms, tomatoes in sea salt, olives on home-made rusks and oven-baked potatoes, as long as we satisfy our hunger in moderation and take small bites at a time, just enough to stimulate the taste buds. Tsipouro may also be consumed to put the finishing touches to a rich meal thanks to its sharp taste and digestive properties. Tsipouro is enjoyed to the full when served cool at 10ºC or with a small amount of ice.